Best Phones For Grandparents. Your grandparents are probably not going to be interested in a mobile phone that has all the whistles and bells and top of the range latest technology. So unless they really have a need to browse the web, update their social networking sites or listen to music on their handset, it might be wise to save a little money and opt for something other than a smartphone. 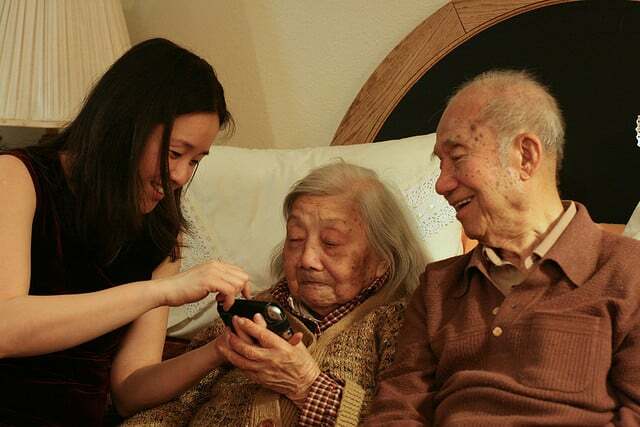 If your grandparents are fairly technically savvy then they might like a handset that has a camera feature so they can capture spur of the moment images of the family. They can then upload the images to their computers for viewing later. However, if they are not at all interested in features like this then a simple mobile phone will be ideal. It is just enough to make a call when needed. Simple mobile phones can be bought complete with a sim card for just a few pounds. They are not phones from the biggest name brands but are perfectly functional and are ideal for light users. Choosing the pay as you go option as well will also be the most cost effective option for those who do not really want to use the phone for constant calling or messaging. Check out mobile phone providers’ current deals because they change all the time. For elderly mobile phone users who need something to be as simple as possible then Doro phones are a good buy. Some of these handsets only have 4 buttons which can be pre-programmed with family phone numbers. That way if they need to make a call or contact someone in an emergency it is simply a matter of grabbing the phone and pressing one button. There is no need to try to remember a phone number which can be made all the more difficult in an emergency situation. Some of the Doro handsets also have an alarm and a flashlight making them a useful tool for vulnerable adults. Nokia handsets tend to be really simple to use. Not as straight forward as the Doro phones but with a little practice they can be used very easily. The good thing about Nokia is there software tends to be uniform throughout the range, so if ever there was a need for an upgrade your grandparents will not have to fumble around trying to navigate a new layout, it will be the same, if not very similar to their previous Nokia model. For the grandparents who are young at heart then a mid-range smartphone was plenty of great features. If they do want access to the Internet on the go then the low cost option of the mid-range smartphone is a great choice. Some smartphones have slightly larger dimensions making them easier to hold for those people with manual dexterity issues. A handset such as the Blackberry that has the QWERTY keyboard might be a great place to start. Older users might prefer the comfort of the well-known keyboard layout when sending messages compared to a touch screen or keypad. Predictive text messaging can either be a blessing or a curse for mobile phone users, the QWERTY keyboard alleviates the issue. Phil Turner has changed mobile phone providers several times in the past ten years and has kept the same number all every time. He has also helped his parents to change networks and port their number to their new network.